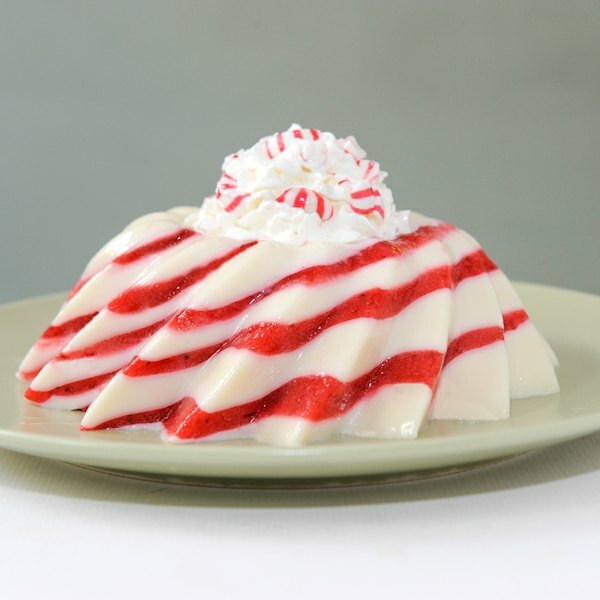 To make this candy cane-inspired gelatin dessert, you'll need to mix up two gelatin flavors to create the layered effect. For the strawberry layers, you'll need: 2 tablespoons of unflavored gelatin powder, 1/2 cup cold water, 1 cup boiling water, 1/2 cup sugar, 1 1/2 cups chopped strawberries and red food coloring. For the creamy mint layers, you'll need: 2 tablespoons of unflavored gelatin powder, 1/2 cup cold water, 1 cup boiling water, 1 1/2 cups (14 ounce can) sweetened condensed milk and 1/2 teaspoon mint extract. In a bowl, sprinkle the unflavored gelatin over 1/2 cup of the cold water and allow the gelatin to absorb the water for two minutes. Whisk in 1 cup of the boiling water until gelatin is fully dissolved, and then whisk in the sugar. Transfer the gelatin mixture to a blender or food processor. Add the strawberries and blend until liquefied. Stir in several drops of red food dye, enough to change the color from pink to red. Set the strawberry gelatin mixture aside at room temperature while you prepare the creamy mint mixture then skim off any foam that has risen to the top. Pour 1/2 cup cold water into a bowl and sprinkle the unflavored gelatin over the water. Allow the gelatin to absorb the water for two minutes before whisking in 1 cup of boiling water. Whisk until gelatin is fully dissolved. Whisk in the sweetened condensed milk and the mint extract until the mixture is smooth. In the freezer or the refrigerator (the process will take a bit longer in the refrigerator), set a 4 cup mold at a 45 degree angle and spoon in a small amount of the creamy mint mixture. Leave it in the freezer for 1 to 3 minutes until the gelatin is set but not completely firm - the gelatin should stick to your finger when touched. If the gelatin is too firm when the next layer is applied, they will not stick together. Too soft and the layers will blend together. Next, stir the strawberry mixture to evenly distribute the puree and spoon just enough into the mold to cover the creamy mint layer. Again, leave it in the freezer for 1 to 3 minutes until the gelatin is set but not completely firm - the gelatin should stick to your finger when touched. Repeat this process, alternating between the creamy mint mixture and the strawberry puree, slowly tilting the mold back towards being level as each layer is added (to prevent the gelatin mixtures from leaking out) until the mold is full. Refrigerate overnight until firm. To unmold the gelatin, dip the mold in warm (not hot) water up to the rim. Don't let the water come over the rim and into the mold. Keep submerged for about 15 seconds. Moisten a serving plate (so you can slide your mold and center it on the plate once unmolded) and place it upside down over the mold. Hold the mold and the plate together, invert, and shake slightly to loosen the gelatin. Carefully pull the mold away. If this does not work, repeat step 9. Garnish with whipped cream and crushed mints if desired. Victoria Belanger is a blogger at "The Jello Mold Mistress of Brooklyn" author of the book “Hello, Jell-O! : 50+ Inventive Recipes for Gelatin Treats and Jiggly Sweets”. She has created recipes and written articles for the Cooking Channel, Kitchen Daily, Apartment Therapy’s:The Kitchn, the Etsy Blog. She has a degree in photography from Virginia Commonwealth University.